 Home › Unlabelled › ONe Social - Network. Bringing it all Together! ONe Social - Network. Bringing it all Together! Social media is a hallmark of today’s world, generating hundreds of billions of interactions each day. However, most channels where these occur are owned by companies and outside interests, which harvest them for information and often retain all rights to use media developed and posted. 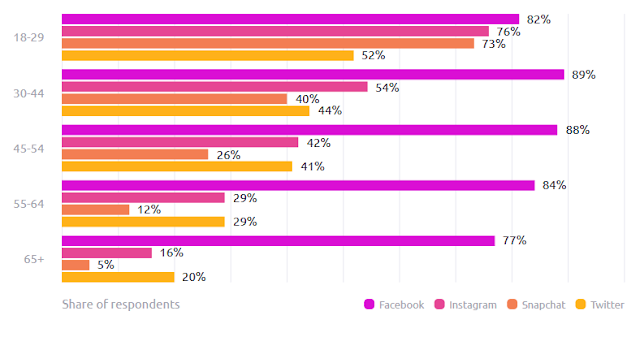 Despite involving aspects of our public and private lives, there is little clarity over what is truly public and confidential data in today’s social channels. ONe is a new social network that uses the latest technologies to provide a wide range of services that are digitally secure and private for our users. Combining the latest in Blockchain and Dapp technologies with built-in privacy and security features. ONe gives customers the ability to control their data and privacy on a level never before seen. Blockchain-based technologies and cryptocurrencies have the ability to revolutionize the way people interact on social media, making the entire process more secure through self-governance and individual ownership of data. 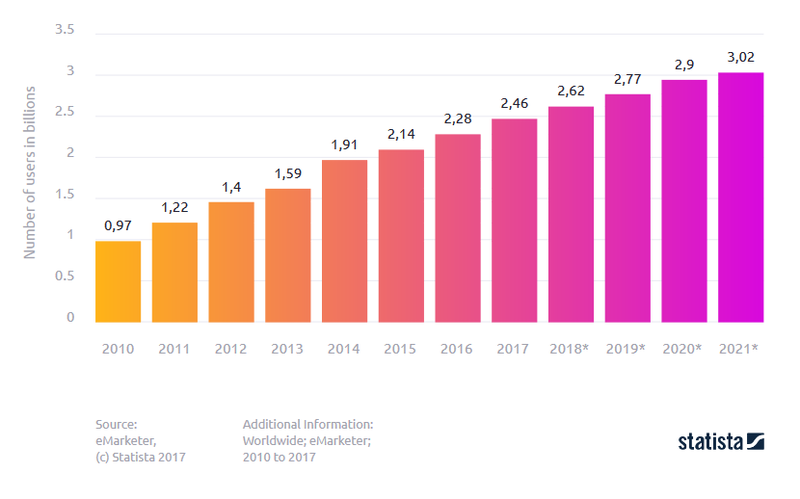 Unfortunately, looking at the 3.77 billion Internet users — 2.79 billion of whom already use social media — we find that just 3.2 million are currently engaging with cryptocurrencies. This creates a significant disconnect between capability and likelihood of true privacy because no mass market service has generated enough interest to reach mainstream adoption. ONe has put together this report to set forth a vision on the social blockchain ecosystem that can be created to pro- vide customers with social channels they control. Plus, we’ll set forth a new cryptocurrency paradigm capable of supporting existing coinage, our token, and a marketplace for individual growth. We aim to build a platform to meet the existing needs of the millions of customers and social media users who are demanding better data controls, privacy, reliability and security— with blockchain as the foundational solution to address these concerns. Our cryptocurrency, One-bit Token (OBT), will launch in the first quarter of 2018 and is based on the next generation of blockchain and proof-of-stake technologies. It is designed to support new decentralized applications and work in conjunction with leading cryptocurrency wallets. We will maintain the ONe protocol and core network, with this document providing an overview of proposed technologies, solutions, and purpose. The next generation of social networking will not only live on smartphones more than any other device, but they will focus the renewed call for privacy and data control occurring on many of today’s social networks. Instead of centralized servers, data will live in decentralized systems to help ensure its safety from theft and corporate misuse. Tomorrow’s social networks will provide a service that treats users like customers, instead of the existing model where users are the data-gathering mechanism that creates information sold to advertisers. 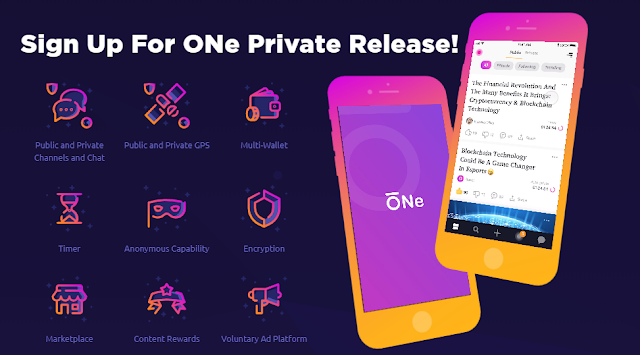 Our vision for ONe is a feature-rich platform designed to communicate with anyone anywhere in the world through video, voice, text, and other unique ways, without having an outside or unseen force lurking and gathering data from the input as well as user habits. We will achieve our place in the future of the social network landscape by creating an end-to-end encryption proto- col that will cover all communications and interactions, combined with a variety of tools that remove messages after a certain time or allow for anonymity in the service. Decentralized data and upload management will allow us to eliminate privacy threats. ONe recognizes that such a framework and service will need a variety of funding options and revenue streams to maintain long-term viability. Our goal is to combine a future marketplace for the sale of goods and services with a native cryptocurrency, while also supporting established cryptocurrencies. Our token, called Onebit (OBT), is an ERC20 compliant token that will serve as the mechanism for the exchange of goods and services, rewarding content creators, purchasing premium content or subscriptions, donating to charities or for crowdfunding on the platform, and many other types of value exchange, rewards and payment interactions. Joining us during our Initial Token Offering, and in pre-ITO stages, will allow participants who contribute early on to receive One bit at a discounted rate and to be eligible for Onebit Token bonuses. Ultimately, ONe has set an ambitious goal of becoming a premium social network designed to scale quickly through the promotion of user privacy and control of their information, rewarding content creators for their value and creating a marketplace for safe and private transactions. ONe has created Onebit token (OBT) to be a new, native cryptocurrency available for use within the ONe ecosystem. These tokens will allow users to send and receive currency, purchase or sell goods, exchange services, participate in opt-in advertising campaigns, crowdfunding events, and much more. Marketplace Onebit will be used in our marketplace to buy and sell goods, purchase premium content, subscribe to content creators page as well as other marketplace functions. ONe will collect a 1-5% fee for transactions while sellers and content creators will keep the rest. Opt-In Ad Platform Onebit will be used in our opt-in advertising that will be restricted to the Public Feed only. Advertisers who purchase ads on our platform will buy our Onebit token and will reward users for partici pating in their advertising campaigns. ONe will approve and collect a negotiated fee from advertisers for this privilege. 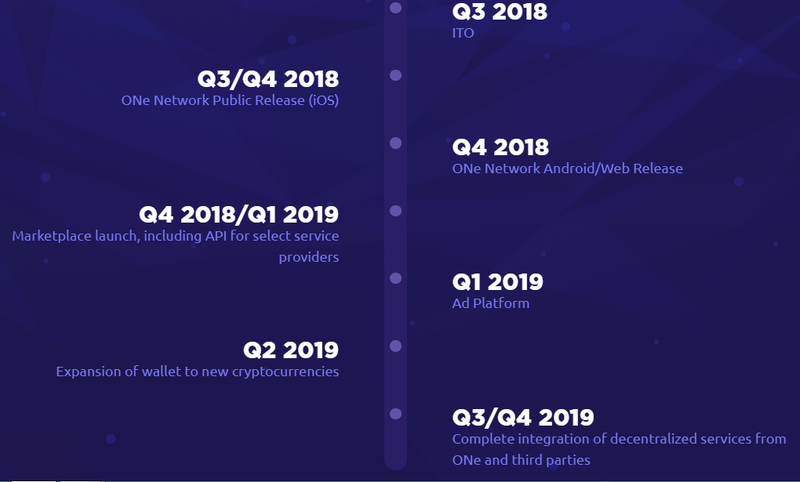 Rewards Onebit will be used to reward users and content creators alike within the ecosystem for different activities that promote the health and viability of the ONe Network. Users will also be able to send Onebit to each other within the ecosystem as a reward, tip or to simply say thank you! Onebit Tokens (OBT) will be provided via an initial Pre Sale and Main Token Sale as well as be available for direct purchase or reward within the platform. ONe Network will be available in a private release offered to buyers/participants of the Token Sale in iOS version. 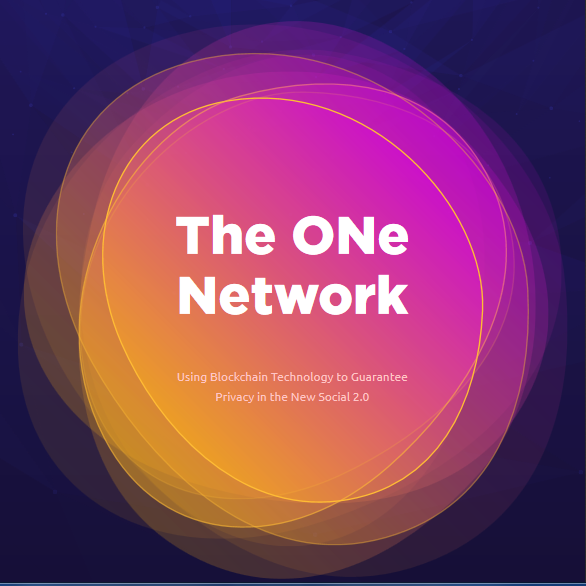 ONe Network is a tokenized, social media platform that will bring privacy and control of a user’s own content and data. Our platform will allow for millions of users and content creators to reward, buy and exchange digital tokens from directly within the platform without the use of centralized entities. 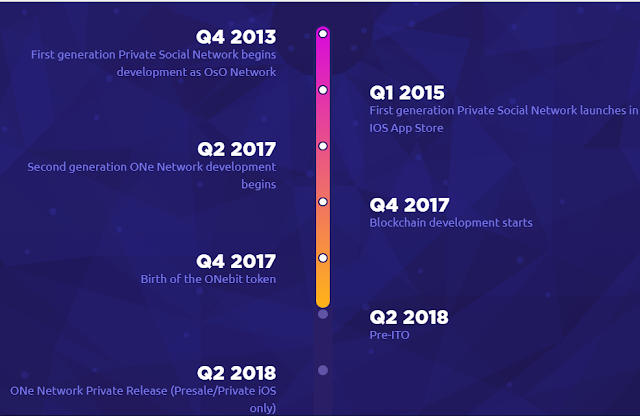 ONe is powered by the Onebit token (OBT) and being built on top of Blockchain Technology to secure freedom of expression for the Next Generation. Unsold OBTs: All unsold OBTs will be either moved to Ecosystem reserve supply or burned over time. 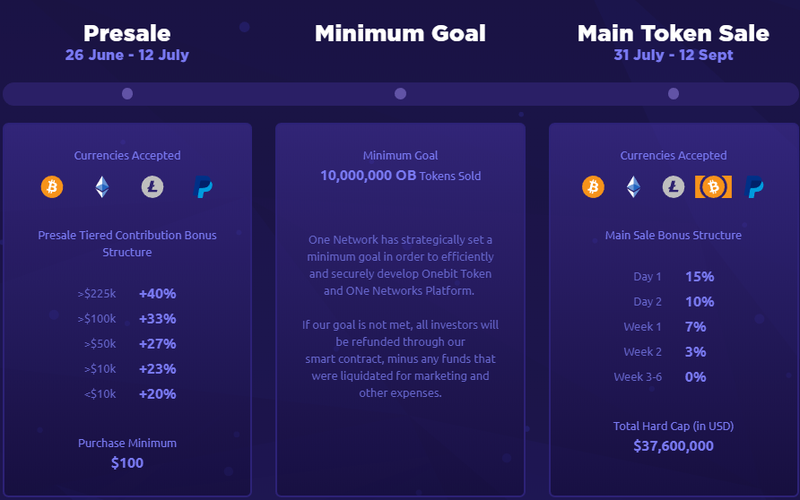 One Network has strategically set a minimum goal to efficiently and securely develop Onebit Token and ONe Networks Platform. If our goal is not met, all investors will be refunded through our smart contract, minus any funds that wereliquidated for marketing and other expenses. A total of 20% of the Onebit supply will be reserved for the Founders, Development team and Advisors and will be distributed with a 6 month cliff and a 24 month vesting period for Team members. During initial efforts, ONe will work to distribute other tokens throughout the system to ensure a steady and stable economy that can grow with the platform.